Built in collaboration with Datachoir. 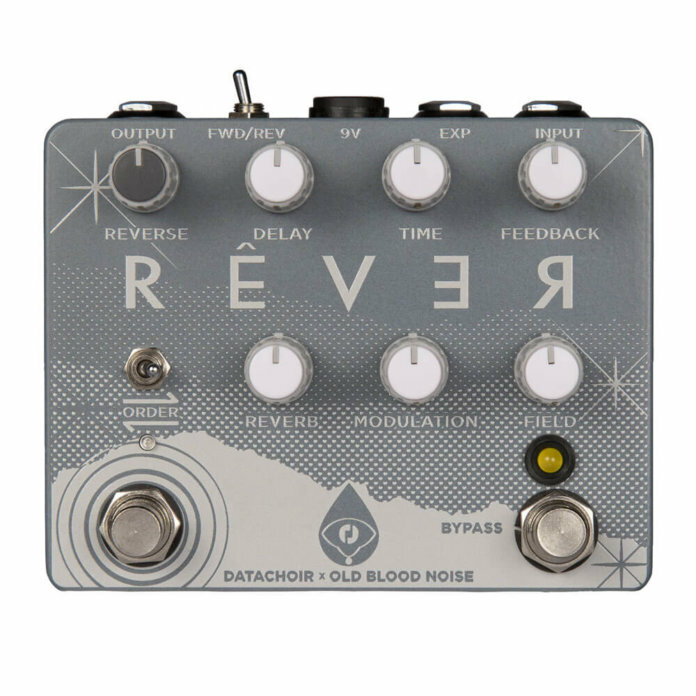 Shaped by the sonic ideas and pedal-building proves of long-time friends Old Blood Noise Endeavors and US-based band and creative force Datachoir, Rêver is a uniquely collaborative combination of modulated reverb, delay and reverse effects. With Rêver’s intuitive, yet deep control set, familiar effects combine to create a number of inspiring new textures. Originally released in a very limited US batch in 2018, Rêver is back for 2019 but with additional features and improvements. It brings its unique sound to a wider audience of players that wish to stretch beyond, wherever they may be. At its core, Rêver is built around two signal blocks: One side allows for a momentary or latching (all switchable via the toggle on the back) reverse of your signal, while the other block contains a modulated reverb that is fed into a delay. This lets you go from sweet modulated ambience to reversed textures in seconds flat, seeing you put cool creative reverse FX on single stand-out melody lines or entire chord progressions, then returning to a comforting sea of forward-moving ambient waves. The toggle switch on the front allows you to set the order of the blocks. With the reverse at the start, and reverb and delay after, the sound tends to feel washier and the reverse is smoother. Switch the reverse to the end of the reverb and delay signal, however, and you have a more pronounced and choppy, glitch-like reverse effect. In addition, there’s an expression input on the back that lets you control the mix of the reverse on the fly. You can go from a subtle reverse effect in the background to a complete reversal of your signal simply by rocking your foot. This pedal might be simple in concept and controls, but the variety of sounds are near endless.